In 1822, Denmark Vesey was found guilty of plotting an insurrection—what would have been the biggest slave uprising in U.S. history. A free man of color, he was hanged along with 34 other African Americans in Charleston, South Carolina, in what historians agree was probably the largest civil execution in U.S. history. At the time of Vesey’s conviction, Charleston was America’s chief slave port and one of its most racially tense cities. Whites were outnumbered by slaves three to one, and they were haunted by memories of the 1791 slave rebellion in Haiti. In Denmark Vesey’s Revolt, John Lofton draws upon primary sources to examine the trial and provide, as Peter Hoffer says in his new introduction, “one of the most sensible and measured” accounts of the subject. 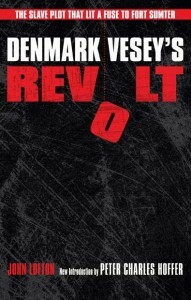 This classic book was originally published in 1964 as Insurrection in South Carolina: The Turbulent World of Denmark Vesey, and then reissued by the Kent State University Press in 1983 as Denmark Vesey’s Revolt: The Slave Plot That Lit a Fuse to Fort Sumter. Introduction Writer Peter C. Hoffer is Distinguished Research Professor in the history department of the University of Georgia. His recent works include Nation of Laws: America’s Incomplete Search for Justice and Free Press Crisis of 1800: The Trial of Thomas Cooper for Seditious Libel.